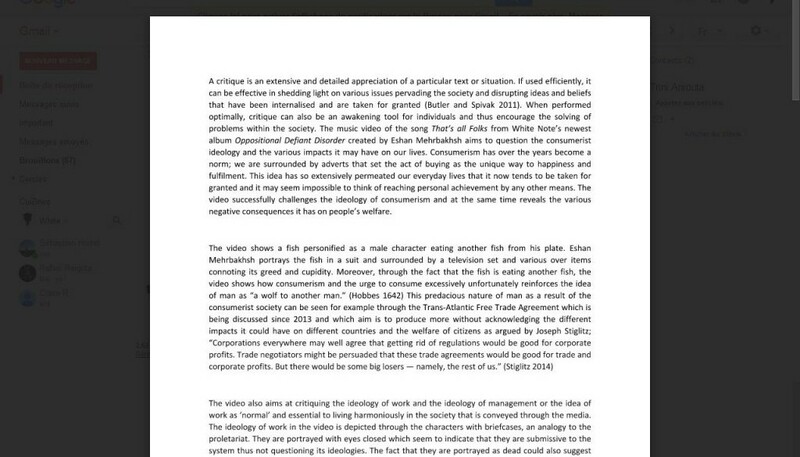 Aniouta Cotegah, a student doing a Bachelor degree in Mass Communication and aiming to journalism and web media, has written a very accurate analysis of « That’s All Folks » clip that we would like to share with you. Aniouta gave us her permission to publish it, thanks again to her! « A critique is an extensive and detailed appreciation of a particular text or situation. If used efficiently, it can be effective in shedding light on various issues pervading the society and disrupting ideas and beliefs that have been internalised and are taken for granted (Butler and Spivak 2011). When performed optimally, critique can also be an awakening tool for individuals and thus encourage the solving of problems within the society. The music video of the song That’s all Folks from White Note’s newest album Oppositional Defiant Disorder created by Eshan Mehrbakhsh aims to question the consumerist ideology and the various impacts it may have on our lives. Consumerism has over the years become a norm; we are surrounded by adverts that set the act of buying as the unique way to happiness and fulfilment. This idea has so extensively permeated our everyday lives that it now tends to be taken for granted and it may seem impossible to think of reaching personal achievement by any other means. The video successfully challenges the ideology of consumerism and at the same time reveals the various negative consequences it has on people’s welfare. The video also serves as a critique for consequential effects that consumerism have on the society. For instance it reveals the drawbacks of the consumerist society on the environment. The portrayal of the industrial fumes or the video’s main character being eaten by a factory at 02:46 minutes seems to indicate how consumerism and industrialisation are noxious. Moreover through the personification of the trees – the red colour of their cut branches representing blood as well as their human physical aspect, allows a deeper realisation of the situation of how “the production, use, and disposal of products for human use is responsible for much of this decline” (Kaza 2000) in the environment. The video also shows how the media shapes our view of the world and serves as a medium to reinforce the consumerist ideology but also how it gives way to the objectification of women. This is done by the representation of the television in the video showing how women are portrayed as objects of “sexual desire” (Goffman 1974) to boost sales of any random product (03:06). The media is also shown to control our minds at 03:15 to 03:28 minutes as it further establishes consumerism and labour as the norm. White Note and Eshan Mehrbakhsh hence successfully reveal how consumerism is dangerous for us. Through the drawing of the gun at 02:21, one understand the destructive nature that consumerism creates and thus despite claiming to be a means to happiness it shows how the insatiable thirst for more production and profit actually does the contrary as studies show that “materialistic individuals experience relatively low levels of well-being.” (Bauer et al. 2012). Moreover, at 02:30 the video serves as a revelation of how “surveillance programmes are violating the right to privacy and are excessively secretive, in violation of international human rights laws.” (Finley and Esposito 2014). This video serves as a good critique as it is also a “self-critical process” (Butler and Spivak 2011) as indicated by the lyrics “we’re our own black hole”. Furthermore it does more than just expose and condemn the ideologies of consumerism and work and their negative impacts but seems to offer an alternative to them. By juxtaposing the image of the dead characters of the film to the lyrics “it’s all our fault, we should’ve fought” it shows how we should not be submissive to consumerism as despite seeming to be empowering and liberating through the choices we seem to make about our self-identity when buying (Davis 2008) it actually is debilitating. Also it shows how if we open our eyes as the main character and the one at 05:30 and stop accepting ideologies as ‘natural’ and impossible to change we can fight back by maybe “politicizing the act of buying in order to search and promote other types of consumption.” (Bossy 2014). The video by adopting an approach to critique that goes beyond criticism is able to expose truths about the society and provoke questioning of things that we might usually accept as ‘normal’ and ‘natural’. By making use of satire, this video is able to arouse its audience’s critical thinking and challenges one’s view of society. Art and satire as modes of critique are therefore more effective than mere criticism as they trigger us to think more deeply rather than analysing issues on the surface as it could have been the case if the issues of the society in the video were explicitly exposed rather than implied. Anthony, Harper. 1997. The Ideology of Work. London: Tavistock publications limited. Hobbes, Thomas. 1642. De Cive. Kaza, Stephanie. 2000. “Overcoming the Grip of Consumerism”. Buddhist-Christian Studies 20: 23-45. Stiglitz, E. Joseph. 2014. “On the Wrong Side of Globalization”. The New York Times, March 15. The White Note and Eshan Mehrbakhsh. 2015. That’s All Folks. Youtube video.